This is a gently used David Yurman albion ring with a blue stone. I believe it to be the blue topaz ring in this link. http://www.davidyurman.com/women/rings/-20PC/petite-albion-ring-with-diamonds?swatchId=Y03P8 In the spirit of full disclosure, there is a tiny black mark on the back of the stone. I never noticed it until I went to take these photos. You could probably remove it, or have a jeweler professionally clean it! Also in the spirit of full disclosure, the stone is the tiniest bit loose. If you shake it next to your ear, you can hear the faintest rattle. I had a jeweler check it and he said it was secure.. I've been wearing it this way for several years without worry. You could probably have it tightened if it bothered you. I do not have the original papers or box. Current retail is $650. I'm asking $400 OBO. I wear ring size 6 and this fits me perfectly or a bit big. I am a private party, so this is final sale unless misrepresented. Beautiful minty blue/green tourmaline cut by Dan Stair, 1.86ct 5.94 x 7.87 mm. Rose gold ring setting .45ctw, size 8. Sizeable within about one size. One of my favorite things about this setting is that you can wear a band flush with it. This is one of my most complimented pieces, it's truly stunning! The last group pictures give the best idea of the color, this one is so much better in person! Reasonable offers welcomed. Please ask questions, all sales are final. This is a vintage, Southwestern, genuine turquoise ring. It is in excellent vintage condition and is a size 6. There are some tiny pits on the surface of the stone in the dark area. $50 Shipping is $17.99 including tracking. I am ilovegemstones on pricescope. Please email me at sowmya33atgmaildotcom if interested. Huge pinkish peach topaz cut by Dan Stair and set by Daniel M in his silver Sweet Sadie necklace. Necklace is 18" and has a huge presence on the neck as the stone is 10.4mm without the bezel. An untreated topaz in this size and color is pretty rare. I can provide a neck shot on request. Here is Dan's original listing: STONE: Topaz CUT: Fancy Round WEIGHT: 4.52 Cts. DIMENSIONS: 10.40mm ORIGIN: Pakistan TREATMENT: None COLOR: Pastel Peachy Golden CLARITY: Very Good (Generally Eye Clean) CUT BY: Dan COMMENTS: This topaz has a pastel pinkish golden yellow color and very good brilliance. The cut is a modified round brilliant with 16 facets added to the bottom and eight added to the top. This stone also has very good dispersion (spectral color flashes) for a topaz. Reasonable offers welcomed. Please ask questions, all sales are final. Pier 1 silver mirrored jewelry chest. Retails $350. This is a beautiful and original ring from the late 1800's. There are no chips or cracks to the glass stone or the paste stones. There is very little wear to the gold fill and it has the look of solid rose gold. It is a size 7. The face measures 12mm. It has a hallmark of two arrows pointing towards each other with something like an eye in the middle. I bought this on etsy for $70 but have not worn it at all. https://www.etsy.com/ca/transaction/131518260?ref=fb2_tnx_title I am ilovegemstones on pricescope. No returns unless item is grossly misrepresented. Shipping is 17.99 including tracking and insurance. Thanks! Please email me at sowmya33atgmaildotcom if interested. This is a gorgeous setting in RICH 18K YG. It has such a smooth, fluid, swoopy, curvy, romantic look to it! It is size 5.25 and completely sizeable. The setting was custom made (CAD/cast) by Adam's bench at OWD in June 2013 (I wore it for 3 months). 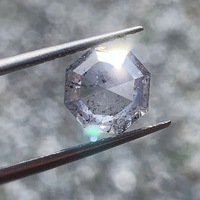 It housed a 3.33 ct. OEC (9.38 x 9.4 x 5.91mm) which is not included in this listing. I know there is some leeway with the size of stone though because Adam and I talked numerous times about other stones that could fit in the setting...even an antique cushion that was similar in size. The stone was removed VERY carefully by Adam's bench in order to preserve the beautiful claw prongs. 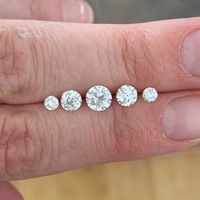 I am listing it at this low price because when I got my new diamond (one with a very different personality) I decided I wanted a totally different setting with six prongs and two-tone. I have to go custom again so this baby has to go! I love how this setting made my OEC look cushiony...the double claw prongs really gave it that feel. The setting looks like a solitaire from the top with a subtle split shank (very elegant) but when you tilt your hand you see the line of sparkle from the pave bar which was executed beautifully. There is no donut so bands can sit flush against the shank which is under 2mm wide after it tapers from the top. The profile has this gorgeous sinuous split shank that perfectly meets the delicate pave band. If I talk any more about this ring I am not going to sell it. :-) I just love it! I am asking $650 Or Best Offer. As I am a private seller, no returns unless the item was grossly misrepresented. Paypal please! Please contact me with any questions! Thanks! Handmade 14kt gold ring (size 6.25, easily sizeable) with a bezel-set 1.50ct unusual, gorgeous red/green/pinkish natural cushion-cut diamond. This ring was made by the very talented Valerie Kronsburg (Valerie K Studio - http://www.custommade.com/by/valeriekstudio/). I am asking only what I paid for it, and might be persuaded to go slightly lower (proceeds from these sales to go to funding my new wedding ring, yay). Email me on ajodasso@gmail.com if you're interested! :) I ship free, FedEx Overnight with tracking. Basically brand new still in box. Sprayed just a couple of times (but I would say 95% full just to be on the safe side). Gorgeous winter scent, but sadly did not work for me. Chocolate Greedy Notes: moka bean, bitter orange, cacao cream, vanilla from Madagascar Feel free to ask any questions as the sale is final. ***SOLD 11/19/13; was asking $600, took $425*** Purchased for around $1000 in May 2013 at a small independent shop in Boston's Diamond District. Diamond does not have a grading report, but my uncle managed jewelry stores for years and had a look at this stone and places it at .30ct, G-H color, VS1 clarity. I have only worn it a few times, so there are no scratches or damage. Inside of band hallmarked "14kt" and "DP." Would work as a band along with a larger solitaire if desired. I prefer to be emailed directly, so, if interested, ajodasso@gmail.com is where to reach me. Will include insured shipping to anywhere. Open to considering offers. 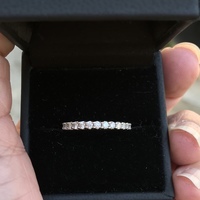 Gorgeous platinum and diamond Tiffany Jazz flexible eternity band, approximately size 6.25 (it fits my size 6.25 finger and also my size 6 finger but a little more loosely). This ring is hallmarked T&amp;Co and PT950 and has approximately 1.06 carats of G, VS round diamonds in a bezel setting. To me, this ring looks like more than about a carat of diamonds! The ring is flexible so it's very comfortable to wear. It retails for $4,800.00 at Tiffany. It will come in the Tiffany black presentation box and the Tiffany blue gift box. I'm blueiris on PS. I welcome your questions and am happy to send more photos. At this time I can ship only to U.S. addresses (sorry!) I will accept PayPal or a personal check/money order, with $20 added for shipping. I'm open to reasonable offers. All sales are final. Oval cut amethyst tennis bracelet. 14kt yg. Wide band marquise cutdiamond ring. Approximate 1/3 ct marquise cut diamond set in wide 14kt yg band. Not sure of stats but I would say G/H, SI1.